Several years ago I scanned my father’s slides of my siblings and me growing up. Dad had put together a nice presentation of photos of our lives, and maybe once a year we’d sit down and enjoy a slide show. I noticed how few photos there were of Dad. He had been the self-appointed family photographer. That is a role that no longer exists. Now, on a family vacation or outing, all family members over the age of 10 seem to have their own camera. How do we keep those photos from being in their own universe, and make them truly family photos? I wrote about one possible solution three years ago, and a How-To blog post I wrote to go with that column remains the No. 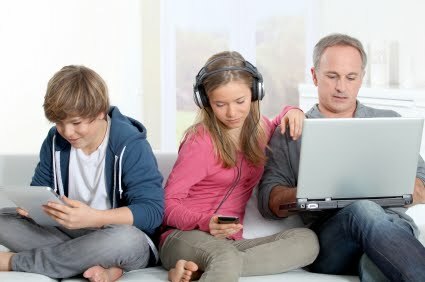 1-read post at FamilyTechOnline.com. That solution used Dropbox, that give you so much free space and hope you will buy extra space as needed. Photos take up a lot of room, so my solution most likely had most users needing to purchase Dropbox space. When my son and I planned our Israel trip, I rethought this problem. Google Photos lets you store an unlimited number of photographs for free. The photographs stored at their original quality if they are 16 megapixels or less. Otherwise, the service downgrades the quality to 16 megapixels, but they are still great looking images. Google can save the original high-resolution photos, but you would likely have to purchase storage space from Google. Before the trip, we each installed the Google Photos app on our phones. It didn’t matter that two of us were on Android and one on iPhone. We turned on the setting to have the app upload our photos to our individual Google accounts when we were on Wifi. That saved us using up data on our data plan. Just before we left, Google announced shared folders. I created one and invited my son and wife to join. This lets us have an album we all can view. At the end of the trip, each of us opened our own Google Photo app on our phone and selected the photos we’d taken in Israel. We had the app copy all the photos to our shared folder. Then as I was creating my blog posts about the trip, I had all the photos the three of us had taken in one spot. Google Photos even let me do some simple editing to my photos. Most of the editing I do to photos is to crop them to improve their composition, and I could do this online in Google Photos. Once it has your images, it can help you present them to the world. You can create your own folders that you can then share publically. Google Photos’ assistant feature creates movies and stories from photos automatically. It usually does an amazing job. I’ve put two from other trips in this week’s link post at FamilyTechOnline.com. With the movies, it assembles photos and videos shot together into a story, with a musical soundtrack. If you do not like the movie it creates, you can create your own on your phone’s app. I created one for our trip. Other parts of Google Photos have some special powers of their own. Photos uses machine learning and image recognition to identify the people in your photos. I can ask it to show me all the photos I’ve taken of my wife, son or father, for example. If you let your phone encode the GPS coordinate when you take a photo, Google Photos can show you all the photos you’ve taken in a particular location. Photos can use that location information to include maps in the stories it creates. The most important feature of Google Photos is it automatically copies your photos off your phone and into the cloud. Usually when someone loses their phone, or it breaks, the greatest lamentation you hear from them is they have lost all their photos. Google Photos auto backup can save your photos in case of disaster. Once the photos are in the Google Photos cloud, you can download them to your PC. You can share them with friends and family, and use Google’s machine-made stories and movies of your photos, or make your own. Seem like a good idea, but a little intimidating? Look for another “How-to” in the link post to help you out. As I look over the hundreds of photographs we took in Israel, I am pleased to see myself in some of them. Had this trip been done in the 1960s, there might be three of the family photographer. This trip we were all the family photographers and videographers.